His Influence on Jewish Thinkers. German philosopher; born at Stuttgart 1770; died at Berlin 1831. After studying at theUniversity of Tübingen he became tutor at Bern and Frankfort-on-the-Main, and lecturer (1801) and professor (1805) of philosophy at Jena. In 1808 he became director of a gymnasium at Nuremberg; in 1816, professor at Heidelberg; and in 1818, professor at Berlin. 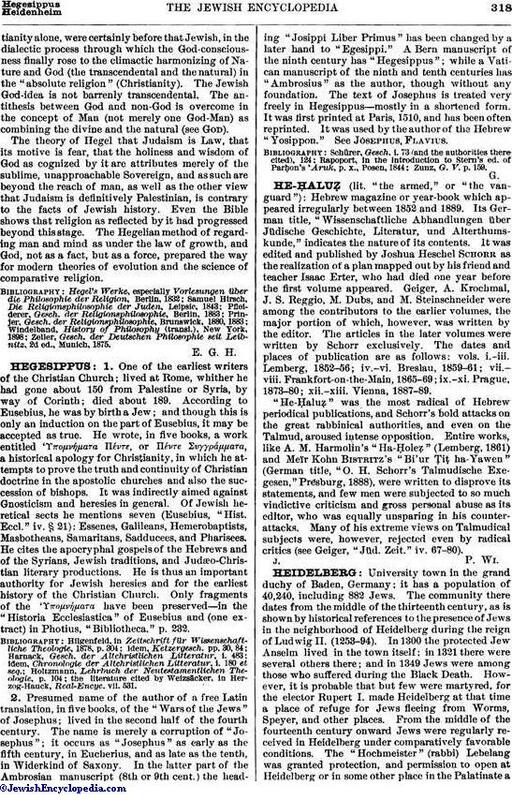 Hegel may be said to have been the founder of a school of thought dominant in Germany until the rise of modern natural sciences in the beginning of the later half of the nineteenth century; even now, though discredited in the land of his birth, it is to a certain extent represented by prominent thinkers in England and America. His system has been described as "logical idealism." According to him, all that is actual or real is the manifestation of spirit or mind; metaphysics is coincident with logic, which develops the creative self-movement of spirit as a dialectic and necessary process. God is this self-unfolding spirit, and in the course of the selfrealizing, free process of unfolding, creation leaps into being. The world is a development of the principles that form the content of the divine mind. The influence of Hegel's system was especially potent in giving the first impulse toward the elaboration of a philosophy of history. From his point of view history is a dialectic process, through which the divine (the absolute mind), in ever fuller measure, is revealed and realized. This absolute is the unlimited and as such, in the fate of the various nations which represent successive limited and finite objectifyings of certain particular phases of the dialectic movement, exercises His highest right, and thus operates in history as the Supreme Judge. This interpretation of history has since become fundamental in the theology of some of the leaders of the Jewish Reform movement. It has been made the basis for assigning to Israel a peculiar task, a mission. Furthermore, it has helped to enlarge and modify the concept of revelation. 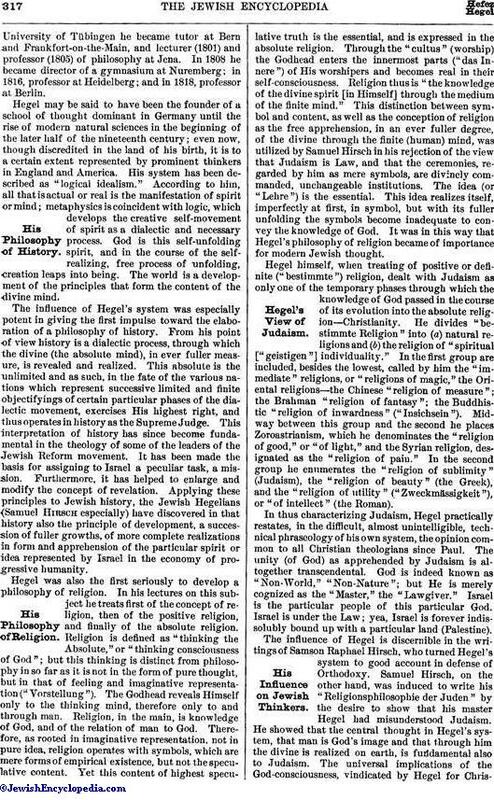 Applying these principles to Jewish history, the Jewish Hegelians (Samuel Hirsch especially) have discovered in that history also the principle of development, a succession of fuller growths, of more complete realizations in form and apprehension of the particular spirit or idea represented by Israel in the economy of progressive humanity. Hegel was also the first seriously to develop a philosophy of religion. In his lectures on this subject he treats first of the concept of religion, then of the positive religion, and finally of the absolute religion. Religion is defined as "thinking the Absolute," or "thinking consciousness of God"; but this thinking is distinct from philosophy in so far as it is not in the form of pure thought, but in that of feeling and imaginative representation ("Vorstellung"). The Godhead reveals Himself only to the thinking mind, therefore only to and through man. Religion, in the main, is knowledge of God, and of the relation of man to God. Therefore, as rooted in imaginative representation, not in pure idea, religion operates with symbols, which are mere forms of empirical existence, but not the speculative content. Yet this content of highest speculative truth is the essential, and is expressed in the absolute religion. Through the "cultus" (worship) the Godhead enters the innermost parts ("das Innere") of His worshipers and becomes real in their self-consciousness. Religion thus is "the knowledge of the divine spirit [in Himself] through the medium of the finite mind." This distinction between symbol and content, as well as the conception of religion as the free apprehension, in an ever fuller degree, of the divine through the finite (human) mind, was utilized by Samuel Hirsch in his rejection of the view that Judaism is Law, and that the ceremonies, regarded by him as mere symbols, are divinely commanded, unchangeable institutions. The idea (or "Lehre") is the essential. This idea realizes itself, imperfectly at first, in symbol, but with its fuller unfolding the symbols become inadequate to convey the knowledge of God. It was in this way that Hegel's philosophy of religion became of importance for modern Jewish thought. Hegel himself, when treating of positive or definite ("bestimmte") religion, dealt with Judaism as only one of the temporary phases through which the knowledge of God passed in the course of its evolution into the absolute religion—Christianity. He divides "bestimmte Religion" into (a) natural religions and (b) the religion of "spiritual ["geistigen"] individuality." In the first group are included, besides the lowest, called by him the "immediate" religions, or "religions of magic," the Oriental religions—the Chinese "religion of measure"; the Brahman "religion of fantasy"; the Buddhistic "religion of inwardness" ("Insichsein"). Midway between this group and the second he places Zoroastrianism, which he denominates the "religion of good," or "of light," and the Syrian religion, designated as the "religion of pain." In the second group he enumerates the "religion of sublimity" (Judaism), the "religion of beauty" (the Greek), and the "religion of utility" ("Zweckmässigkeit"), or "of intellect" (the Roman). In thus characterizing Judaism, Hegel practically restates, in the difficult, almost unintelligible, technical phraseology of his own system, the opinion common to all Christian theologians since Paul. The unity (of God) as apprehended by Judaism is altogether transcendental. God is indeed known as "Non-World," "Non-Nature"; but He is merely cognized as the "Master," the "Lawgiver." Israel is the particular people of this particular God. Israel is under the Law; yea, Israel is forever indissolubly bound up with a particular land (Palestine). The influence of Hegel is discernible in the writings of Samson Raphael Hirsch, who turned Hegel's system to good account in defense of Orthodoxy. Samuel Hirsch, on the other hand, was induced to write his "Religionsphilosophie der Juden" by the desire to show that his master Hegel had misunderstood Judaism. He showed that the central thought in Hegel's system, that man is God's image and that through him the divine is realized on earth, is fundamental also to Judaism. The universal implications of the God-consciousness, vindicated by Hegel for Christianityalone, were certainly before that Jewish, in the dialectic process through which the God-consciousness finally rose to the climactic harmonizing of Nature and God (the transcendental and the natural) in the "absolute religion" (Christianity). The Jewish God-idea is not barrenly transcendental. The antithesis between God and non-God is overcome in the concept of Man (not merely one God-Man) as combining the divine and the natural (see God). 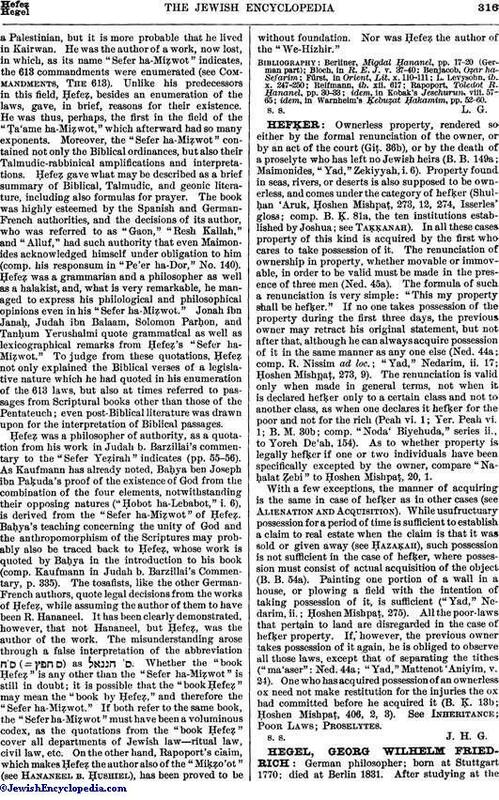 The theory of Hegel that Judaism is Law, that its motive is fear, that the holiness and wisdom of God as cognized by it are attributes merely of the sublime, unapproachable Sovereign, and as such are beyond the reach of man, as well as the other view that Judaism is definitively Palestinian, is contrary to the facts of Jewish history. Even the Bible shows that religion as reflected by it had progressed beyond this stage. The Hegelian method of regarding man and mind as under the law of growth, and God, not as a fact, but as a force, prepared the way for modern theories of evolution and the science of comparative religion. Zeller, Gesch. der Deutschen Philosophie seit Leibnitz, 2d ed., Munich, 1875.